It's said of Fairy that if you are in dire need and call the name of one, they will come. King Oryan, with his castle under siege and his son in his arms, could not be in any more dire need. With only High Marshall Morgan and a handful of Morgan's men at his back, there is only one place left to run, up, and only one ally who can save them. Kyriay, Queen of the Fairy. 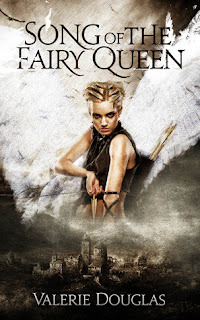 Valerie Douglas brings readers back to the classic and epic aspects of fantasy with her novel, Song of the Fairy Queen. Focusing on Kyri, Queen of the Fairy, and Morgan, a human, Douglas tells a love story that is threatened by war. Though told from an omniscient point of view, Kyri is the main character. Readers follow her as she helps King Oryan fight to regain his throne after his half-brother usurps him. She is a mischievous creature by nature, impish, and full of quick wit. As a leader of the Fairy, she is kind, caring, and completely empathetic. She feels every pain of her people and her lands. Kyri falls in love with the other main character, Morgan, and readers will connect with her on this foundation. Especially since love is something she must sacrifice to save her people. Morgan, leader of the King's Marshals, is the face and strength of the rebellion. He is King Oryan's right hand and plays a major role in keeping faith alive. Morgan is the epitome of bravery, courage, and sacrifice. He always puts himself last when it comes to survival, while giving each task the highest level of importance. Readers will respect Morgan in every way, enjoy his bantering, and acknowledge that he deserves so much more than what he receives. Though the novel is quite lengthy, at around 500 pages, and becomes a bit slow-paced at times, Douglas calls on the classic fantasy novel for description and emotional conveyance. The plot revolves around the war but is softened with the love story of Kyri and Morgan. Even through the cumbersome times, I couldn't put this book down. However, readers must forgive the author for the mistakes sprinkled throughout the novel. Don't let them discourage you from finishing the novel. It's worth it, as Song of the Fairy Queen brings escape and a world only imagined into grasp.